at the Bunyan Centre, Mile Road, Bedford MK42 9TS from 7.30-9.30pm. 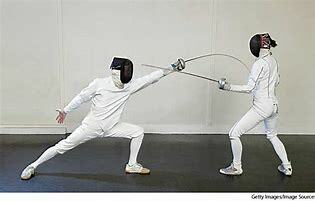 Fencing is NOT an aggressive sport, it is about timing, control and out-witting your opponent with attacking and defensive actions. Bedford Fencing Club welcomes fencers of any ability in any of the three weapons, Foil, Epee and Sabre. Structured fencing with professional coaching in all weapons led by Prof. Jonathan Katz. Coaching by Jonathan Katz, Quentin Berriman, Chris Convine and Daren Tee. We are very proud to have a contingent of successful fencers who regularly compete on the UK and International fencing circuit. We have fencers who have represented Great Britain and various Home Countries. On the Veteran circuit we have World, European and Commonwealth individual and team medal winners ! Saw it at the Olympics? Have been inspired by The Hobbit, Lord Of The Rings or The Mask of Zorro? Want a sport that will increase your fitness & challenge your mind? Just think it looks a lot of fun. Whatever your reasons, a BFC Beginner's Course will be just right for you. All protective clothing & equipment is provided. For just £70 our course will take you from complete novice to competent fencer in just 8 weeks. Which course are you signing up for?